An accident involving multiple SEPTA trains at 69th Street Terminal in Upper Darby this morning has left 4 people injured, 1 critically. The crash happened around 8:30 a.m. Tuesday in the loop outside the station. The trains are used for the Market-Frankford Line. 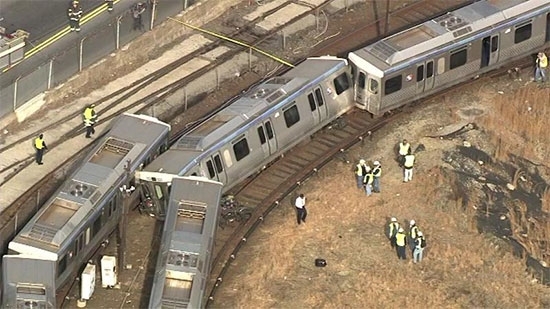 According to SEPTA, Train 57 rear ended Train 67 which was stopped on the track. A third train, Train 51, moving in the other direction was sideswiped when Train 57 derailed. 18 train cars were involved, 7 of which derailed. The trains were described as "non-revenue" or out-of-service at the time. The train conductor of Train 57 is in critical condition at Lankenau Hospital. Three other people suffered non life-threatening injuries. They include the operator of Train 67 and two passengers. It is unclear why passengers were on an out-of-service train, but Upper Darby Police Superintendent Michael Chitwood had said that one of them was a homeless man that had stayed on the train. Traffic is being directed around the area. Shuttle buses are operating between 69th Street and 63rd Street Station. It will take a few days to clear the tracks using heavy equipment. Those 18 cars will have to be inspected before returning to service. The Market Frankford Line is already experiencing a reduction of trains due to possible cracks. UPDATE: 2/21 1:40pm Market/ Frankford Line: Full train service is resuming, however, no afternoon A-B skip-stops. Passengers should expect minor delays/crowded conditions. The warden at James T. Vaughn Correctional Center in Smyrna, DE has been placed on paid administrative leave just weeks after an inmate uprising and hostage situation left a correctional officer dead. Warden David Pierce has been placed on paid leave and Deputy Warden Phil Parker has been named acting warden. On February 1st, inmates inside Building C took four people hostage, including correctional officer Lt. Steven Floyd, who was killed. The standoff lasted nearly 20 hours before Delaware police entered the building. DOC spokeswoman Jayme Gravell did not say why Pierce was put in leave, but it may not be related to the uprising. Philadelphia Police say that a man made up a story about a child abduction following a car jacking in the Logan section on Monday night. It happened on the 4600 block of North Sydenham Street. A 22-year-old man delivering pizza told police he was carjacked at gunpoint by two men. He also said that he was taking care of a 4-year-old boy and that he was in the back seat of the car when it was stolen. Police found his car at North 16th and Saint Pauls street in Tioga-Nicetown, but there was no child. Authorities began to search the area but could not find the boy. Eventually, after further questioning the man admitted that he made it up and that there never was a child. There is no word on any charges. Police are still investigating.